Like its forebears, the 1983 Porsche 930 Turbo was forged in the heat of real-world competition and refined around the world on the open road. Despite its reputation as a furious performer, the 930 Turbo behaves as gently around town as any 911-based Porsche, answering the driver’s moderate input with entirely predictable results. But almost no enthusiast who samples the 930’s charms can resist testing its capabilities, and the result is a literal full-body rush as the boost gauge heads skyward and the 3.3L flat-6 boxer engine zooms past 4,000 RPM toward the 5,500 RPM redline. But the 930 Turbo is about more than its powerplant, as one will discover with joy when easing into a winding curve or applying the Turbo’s massive 4-wheel disc brakes. And as anyone who has experienced the Turbo from behind the wheel can attest, there is the additional pleasure of piloting a car that commands the instant attention and admiration of all who see it. If any car makes a statement about its occupants, the 930 Turbo is It, perhaps especially when finished in this example’s deep ebony black exterior with black interior. It has been garage kept and only driven during good weather, and well maintained. 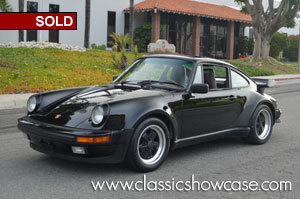 Finished in its original color with only 86,000 original miles with limited ownership. It features sports seats, Fuchs-style wheels,cocking differential, and a Turbo intercooler. The 930 is scheduled for a full service and detail by our team of Porsche specialists. The Porsche 930 was a sports car built by Porsche between 1975 and 1989, known to the public as the 911 Turbo. It was the maker's top-of-the-range 911 model for its entire production duration and at the time of its introduction the fastest production car available in Germany. Porsche reintroduced the 930 to the Japanese and U.S. markets in 1986 with an emission-controlled engine having a power output of 282 PS (207 kW; 278 hp). At the same time Porsche introduced Targa and Cabriolet variants, both of which proved popular. The 3.3-liter version of the 911 Turbo Carrera (known as the 930) could do 0-60 in about 4.9 seconds at a time when a new Ferrari or Corvette were hard pressed to do the same thing in less than 8.0 seconds. Handling could be very tricky because the turbo was very much an “on” or “off” thing. Boost coming on suddenly in the middle of a corner was the undoing of many 930 drivers. Had flared fenders and a whale tail rear spoiler.